What is a “continuum of care”? Cedar Hill is one of the few senior communities in Vermont that offers a full continuum of care, transitioning from one stage of life to another, minimizing the effects of change that can be difficult later in life. We are a community that offers several levels of assistance, including independent living, assisted living, specialized memory care, and skilled nursing care, all on one campus. That means that once you move in, you are able to “age in place”, a concept that advocates allowing a resident to choose to remain here regardless of the physical and/or mental decline that may occur with the aging process. 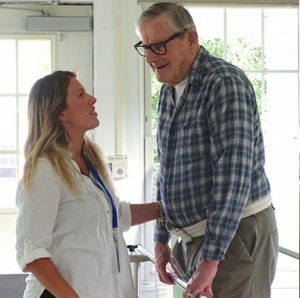 You can move in as fully independent living, with your own car, and if or when your circumstances change, your health declines or you have a fall that breaks a hip, you can convalesce in the skilled nursing home, regain your strength in our rehab unit, then return to your apartment if you wish. We offer a continuum of housing, residential services, and health care system all in one place. What happens when my family member’s health changes? Our nursing home community residents receive priority for transfer to the most appropriate level of care within our community. When a move occurs, it is usually less traumatic because the resident and family are already familiar with our facilities and staff. Many times a resident’s condition will improve, enabling him or her to transfer from our nursing facility to our assisted living facilities. Can my family member keep his or her own personal physician? Yes, as long as the physician’s practice is within a reasonable distance of Cedar Hill, allowing transportation to medical appointments. However, it is also advisable to establish a backup physician with admission privileges to local hospitals should the resident require acute hospital admission. We have a contracted medical doctor who does house calls twice a week here at our nursing home. Nursing home residents must have an attending physician who agrees to visit the resident regularly at our nursing facility. State and federal regulations for skilled nursing facilities require this. Do you offer Rehabilitation Services, such as for recovering from a broken hip or a stroke? Yes, we do. We have skilled beds just for that purpose in our Health Care Center. We have consultant physical therapists, occupational therapists and speech therapists that work with our skilled nursing staff for rehabilitation. We offer this to residents who live at the Cedar Hill community and for those who choose to come here after a hospital stay to get rehabilitation before returning to their homes. 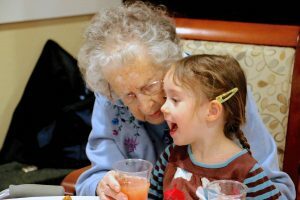 After an acute care illness and stay in the skilled nursing center, can my family member return to their apartment in the Village or Memory Care Center? Yes, as long as the resident recovers to that level of independence, and the resident has chosen to hold his or her accommodations. What does the resident need to bring when moving into Cedar Hill? Village residents are responsible for furnishing their apartments completely. We encourage residents to bring some or all of their furnishings and/or favorite things with them to their new home. The resident may bring a comfortable chair, pictures, and other personal items, as well as personal clothing and supplies. We provide a hospital bed and dresser. Yes, we are pet-friendly! But prospective residents must discuss their desire for a pet with our staff before moving to our assisted living or nursing home. We generally allow cats and smaller dogs. Cedar Hill is currently home to cats, birds, bunnies, and fish and has regular visits from family, staff, and therapy dogs. We’ve even had baby lambs, goats, bunnies, chicks and horses come by to visit. We strongly believe that pets add to life and we will accommodate them whenever possible. When can I visit my family member? Anytime. We encourage family visits and participation in all our events. What religious programs are available? We believe in supporting our residents in keeping an active faith life. Cedar Hill has a local church minister who conducts on-site services and visits with individual residents. We have weekly in-house rosary groups and regular visits from our local Catholic priest and other Christian ministers. All nursing home residents are encouraged to attend whatever services they prefer. Some of our retirement Village residents drive and attend local churches as well. There is also a private chapel located in the Village for special services. My family member is not self-motivated. What do you offer for activities? We encourage the highest level of independence possible. We encourage and assist residents to attend activities, even if on a passive level. Residents particularly enjoy the musical events, social hour and the Adopt-a-Grandparent program with some of the local school children. During the warmer weather, outside events include gardening, walks, the Quechee Balloon Festival, van rides and visits to local events and places. Do residents have a chance to participate in outings in the community? Yes they can! We have regular outings as well as encouraging our residents to be active members of the community. Is there an entrance fee for Cedar Hill Health Care or The Village? No. We are a continuing care community, but there is no requirement that you “buy into” our retirement home community. You pay for the level of service that you choose and need on a monthly basis. Most continuing care communities require a substantial financial deposit and commitment on your part. Cedar Hill does not believe in that approach. You earned the right to retain your savings for as long as possible. However, potential residents must fill out an application and provide financial and medical information before being considered for admission. How do I pay for care at Cedar Hill? Residents at The Village at Cedar Hill pay a monthly rent. A deposit is required to reserve a space. Monthly rent includes your room or apartment, all utilities (except cable tv and personal phones), three daily meals and most outings and activities. Cedar Hill Health Care Center accepts Medicare and other insurance for skilled nursing and rehabilitation stays. We have various options for payment. Our accounting department can help you with payment options. Please call us for more details and we will assist you in determining options for you to become a member of our community. What is the main source of referrals to Cedar Hill? The number-one source of referrals is from current and previous family members and residents. Other referrals come from hospitals, doctors and other members of the regional medical community. Yes, in every part of our community. Whether you need a break for an afternoon or a month, please contact us for details. What makes Cedar Hill different from other assisted living facilities in Windsor? 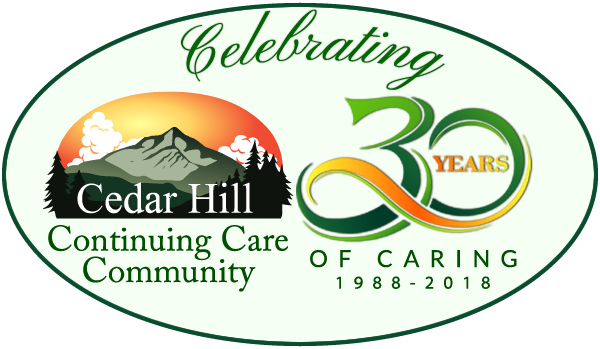 Cedar Hill offers a continuum of care, from independent and assisted living to skilled nursing and rehabilitation care to comfortable and dignified end-of-life care. 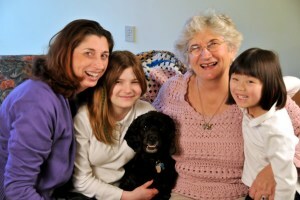 It is all here on the same campus, with the same loving family of caregivers. We are a Vermont family-owned company, . Moving anywhere is a big transition, and we’d like to make it as easy as possible. Feel free to call us with any questions, or to arrange a visit and tour of our campus. Let us show you our lovely building and grounds, meet our staff and residents, and see what it’s like to call Cedar Hill home.